Disasters such as these can devastate the business and charitable operations of a not-for-profit organization. 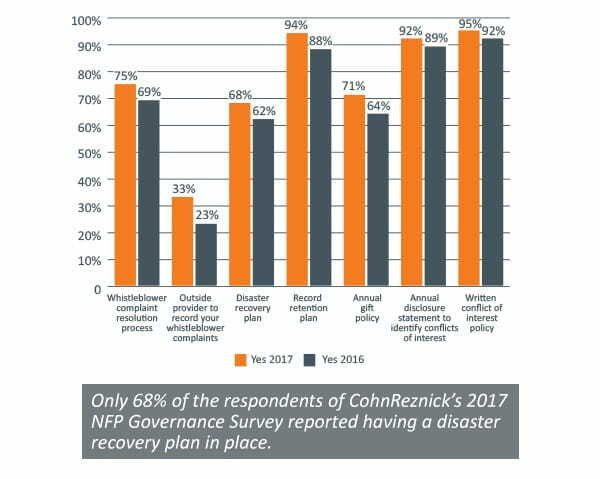 However, based on findings from CohnReznick’s recently released 2017 Not-for-Profit Governance and Financial Management Survey, only 68% of survey respondents, comprising of not-for-profit industry professionals and board members across country, reported having a disaster recovery plan in place. All not-for-profits should have a clear roadmap to enable them to minimize the impact of a disaster, resume operations, and recoup losses in the event of an unforeseen circumstance. Planning for these events can ensure that the organization survives and thrives. Planning for unexpected natural events and interruptions can be challenging, yet it is necessary, as the impact on business operations can be substantial, resulting in interruptions in programs, lost members, increased costs, and missed opportunities. In some cases, these losses may exceed those caused by physical damage to property and equipment. Not-for-profits need to be prepared for these issues. Below are recommended focus areas for not-for-profit leadership in order to best accomplish this. A people-management plan to identify who should do what in the event of an emergency. This plan should identify the names and contact information of recovery teams and personnel. Once you have prepared a disaster recovery plan, you should test the plan at least annually to ensure, among other things, that your organization’s personnel are adequately prepared and rehearsed. Evaluate and modify your disaster recovery plan as necessary after each test. Business interruption losses are often covered under business property insurance policies, so there are some important preliminary steps that not-for-profits can take toward recovering these losses. The first step is to contact your insurance company to provide a notice of claims. Affected organizations may also need to consult their legal advisors to determine the scope of insurance coverage and the types of losses covered, before beginning the process of documenting and quantifying losses. Partnering with experienced risk management professionals to develop loss recoupment strategies and carry out damage analyses to support claims will also enable not-for-profit executives to focus on the all-important task of restarting the business. In the event that a disaster strikes your workplace or community, you will likely want to assist your employees, or other members of your community, by providing, food, clothing, shelter, employee loans, etc. Ensure that you are aware of the tax guidelines associated with these efforts by consulting IRS publication 3833, Providing Assistance Through Charitable Organizations or a tax professional. Employers may also want to refer employees to The Federal Emergency Management Agency's (FEMA) "Individuals and Households Program" which provides temporary economic relief to families displaced in a major natural disaster when private insurance isn't an option. Additionally, many employers have employee assistance programs (EAP) and providers who can help employees deal with the emotional impacts of a disaster, as well as many more services. As Benjamin Franklin said, “If you fail to plan, then you plan to fail.” It is crucial to plan ahead and have processes in place to mitigate costly business interruptions in case of a disaster. Once you have a disaster recovery plan in place, it’s just as important to rehearse it on a periodic basis to evaluate its effectiveness. Each organization is different and will have different requirements for business continuity/disaster recovery planning. The important thing is to perform a needs assessment and determine which operations are vital in order to keep your organization running in the event of a natural disaster. CohnReznick has a dedicated Not-for-Profit and Education Industry Practice that works closely with the boards, management, and financial leaders for not-for-profit and educational organizations. Our clients include membership based organizations, foundations, educational institutions, not-for-profit affordable housing developers, religious and cultural organizations, and social service agencies. The recovery and rebuilding that follows natural disasters like Hurricanes Harvey and Irma is arduous. Affected communities, and the government agencies supporting them, benefit most from a complex coordination of boots on the ground assistance, scrupulous financial oversight, and across-the-board project management. From 9/11 through Superstorm Sandy and many other natural and man-made disasters, CohnReznick has supported federal and state agencies in managing major recovery programs, overseeing grant distribution, reducing fraud, waste, and abuse, and bringing relief to those in need. provide a foundation to move forward. CohnReznick brings together a multidisciplinary team that works alongside management. With a focus on running the business, we concentrate on restructuring operations, preserving asset value, and rebuilding stakeholder confidence. Our turnaround specialists immediately work to reduce costs, negotiate with creditors, and identify potential capital sources. And, if bankruptcy proceedings are required, we maximize value for all constituencies. Even with the best disaster recovery plan in place, your organization or employees may need assistance in the event of a disaster. See the list of resources below that can assist with recent and/or future disasters. Disaster Assistance Improvement Program’s directory of disaster help and assistance. A path to government benefits for disaster relief. The IRS has already extended filing and payment deadlines for those in disaster areas. Use this article as a reference, but do not hesitate to consult a CohnReznick professional for guidance. Partially excerpted from “Help After a Hurricane: Disaster Resources,” posted by AICPA Communications on Sep 1, 2017.